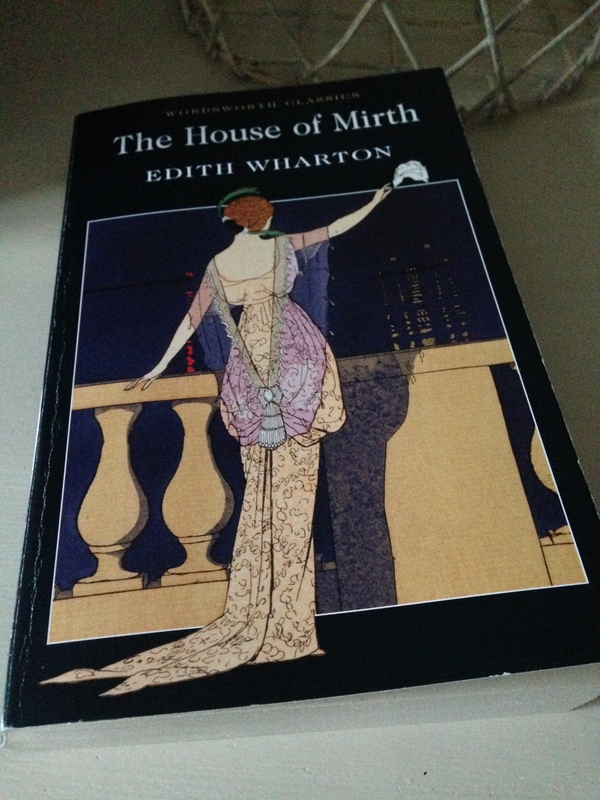 Edith Wharton’s The House of Mirth is such a brilliant classic, I wasn’t sure if I would have anything to add to the multitude of reviews already covering this book, but in the end I decided to capture a few thoughts in this post. That’s about as much as I’m going to say about the plot, but it’s a brilliant story and Wharton executes it perfectly – her prose is magnificent. There are so many additional nuances to the narrative that I haven’t even touched upon here, and I can see myself rereading the novel to revisit Lily at some point. Wharton has created a wonderful character in Lily Bart, one of my favourites this year (along with Cassandra from Dorothy Baker’s Cassandra at the Wedding). Lily is a beautiful and fascinating creature, yet she is also frivolous and a little naïve despite her intelligence and wit. There are times when she doesn’t always make the best choice in life, but she seems to emerge with her own scruples intact. Ultimately though, she falls prey to the politics and conventions of society at the time and Wharton dissects this rather harsh culture with great skill, precision and candour. Bertha Dorset, another fully-realised character, is also worthy of a brief mention at this point as it she who plays a key role in Lily’s fall from grace. So there we are; a few thoughts on The House of Mirth, another one for my end-of-year highlights. Cathy at 746 Books and My Book Strings have also recently reviewed this book. My copy of The House of Mirth is published in the UK by Wordsworth Classics. Source: personal copy. This entry was posted in Book Reviews, Wharton Edith and tagged #ReadWomen, #ReadWomen2014, Book Review, Edith Wharton, Fiction, US, Wordsworth Classics on October 20, 2014 by JacquiWine. I loved House of Mirth. Lily was such a brilliant character. You’re right the dynamic between her and Selden is very well portrayed. Such a wonderful novel, isn’t it? I loved the complexity and different shades in Lily’s character; she’s very frustrating at times, and yet we’re on her side willing her on. This indeed such a superb work. I also run into the dilemma of being at a loss to say anything about a book that is so much a classic. The relationship between Lily and Lawrence was so well sketched out. I think that in the end, it was the heart of the tragedy that was this story. It is hard, isn’t it? In fact, I was thinking about your Jane Eyre posts as I was writing this as I think you’re doing a brilliant job of homing in on small scenes, shedding light on the main themes. I loved the relationship between Lily and Selden; you’re right, I think it’s at the heart of the tragedy. I read this so long ago that my memory of it is a little fuzzy but what I do remember about Wharton is the elegance of her writing, far superior to Henry James for me. You’re right, Wharton’s prose is so elegant, precise and a delight to read – I must read more of her work. Now might be a good time for me to confess that I’ve never read Henry James! Now might be a good time for me to confess that I’ve never read Henry James! Oh, that makes me feel better! I was just about to confess that I’ve never read any Edith Wharton. I really must get round to filling that gap, and The House of Mirth sounds as good a place as any to start. Well, as you can probably guess I loved this one, and it feels like a good introduction to Wharton’s society novels. The only other Wharton I’ve read (so far) is Ethan Frome, also excellent and for a novella it packs a real punch. I;m with Susan on the comparison with Henry James. Did you see the film of “The House of Mirth’? It was rather good. That’s interesting as I’ve never read Henry James, but I’m very keen to read more by Wharton now that I’ve finally got around to The House of Mirth! I have seen the film adaptation as I’m a big fan of Terence Davies’ work. Loved the film. Thanks, Karen. Oh, it’s a tremendous novel, and I think you’d enjoy it very much! I enjoyed this so much, particularly because of how Wharton doesn’t place all the blame for what happens on Lily or on the society she moves in. The final few chapters are incredibly moving. It’s such a great book, isn’t it, Cathy? It probably doesn’t get much better than Wharton. You’re right, the situation is quite nuanced with a mix of influences at play. Lily makes some poor decisions, but she isn’t the sole architect of her own demise; the aunt doesn’t do her any favours as she could have supported Lily by championing her cause. Much of it though seems to come down to others’ perceptions of Lily, and those who take advantage of her position in some way. Having seen the film adaptation, I was familiar with the nature of the ending, but even so, those final chapters are very moving. Our twitter conversation just now reminds me that you must have reviewed The House of Mirth. I’d been avoiding any recent reviews until I’d read the book and written this post, so I’ll head over to yours and take a look! I’ve become a big Wharton fan this year. I liked her The Age of Innocence even better than The House of Mirth, but Lily Bart is in my opinion one of the most interesting characters in 20th-century literature. Oh, that’s great to hear; I have a copy of The Age of Innocence so that’ll be my next Wharton. It’s the light and shade in Lily’s character that makes her so interesting. It sounds as if you may have reviewed these novels so I’ll head over to your blog to take a look. Thanks for the link Jacqui! Very welcome. I knew you it was high on your tbr so I should have checked! I’m glad you posted your thoughts, I haven’t read any Wharton but intend to remedy that having read your post. Many thanks. I hope you enjoy Edith Wharton, and I’d love to hear how you get on. Have you read The Custom of the Country? It’s my favourite Wharton (of the ones I’ve read). I haven’t read that one, Guy, but having enjoyed this novel so much I’ve been looking at Wharton’s other works. The Age of Innocence will be the next one I read (as I already have a copy), but The Custom of the Country sounds excellent. Thanks for the recommendation, onto the list it goes. I am writing from The Mount, in the Berkshire Hills of Western Massachusetts. It is the home that Edith Wharton designed and built in 1902 and where she wrote “The House of Mirth”. It is one of my favorite novels as well and i think your review of it is excellent! Hi Susan, thank you very much for taking the time to read and comment on my post! Wow, The Mount looks amazing, a very special place indeed. I would love to visit if I ever get the opportunity to take a trip to Massachusetts. Thanks again for your kind words about my review and it’s heartening to see so much interest in Wharton’s work. I’d hoped to get to this novel earlier in the year after enjoying The Age of Innocence so much last year, Jacqui, but I just haven’t managed to yet. Glad to hear you enjoyed it, though. If you’re thinking about trying Henry James, please consider giving The Ambassadors a try. It’s a tremendous novel, super interesting on a story and a storytelling level, and it will make you understand why the Wharton/James comparisons above re: “elegance” are apples and oranges in nature and hence a little off base: James was more interested in developing characterization through what’s said and what’s not said and in challenging conceptions re: narrative POV than in being an “elegant” writer. Oh, I’d love to hear what you think of The House of Mirth, Richard. Lily Bart is such a fascinating character, and there’s plenty to get your teeth into with the society set. I’m delighted to hear you enjoyed The Age of Innocence as that’ll be my next Wharton (with The Custom of the Country joining the list on Guy’s recommendation). And I’m very intrigued by your comments on Henry James, so much so that I shall have to try The Ambassadors as some stage! I LOVE Edith Wharton and reread this recentlyish …..so much more accessible than her friend and compatriot Henry James . Lovely review. Thanks, Helen; it’s great to see so much love for Wharton! I’ve never read any Wharton although I appear to own several. Reading your review makes me think I’m missing out. I feel I’m a bit of a latecomer to Wharton myself as the only other one I’ve read (so far) is Ethan Frome (which is excellent, but very bleak). I loved Mirth and Lily Bart, and from what I can gather The Age of Innocence is even better. If you’re interested in trying Wharton, Cathy (at 746 Books) and I are planning to read The Age of Innocence in February. We’re thinking of doing a readalong, so you’re more than welcome to join if you’re interested and able to fit it alongside your Ph.D. commitments! I have a omnibus edition of The Age of Innocence, House of Mirth and Ethan Frome so I may well join you. Your description of Ethan Frome makes me think that would be right up by street too! Yay! It would be great to have you along for The Age of Innocence, but you can always see how things stand in February. I think you’d love Ethan Frome, and it’s short! Ethan Frome is the perfect winter read and I hear the film with Liam Neeson is pretty good too. At this point, I need hardly say that (as usual) I haven’t read Wharton. I noticed today I can get three of her novels (including this one) from the Book People for £4.99 so no excuses! I particularly congratulate you on being brave enough to take on a classic – more of this needed I think! Thanks, Grant. Reviewing a classic is a little daunting, but I’m trying to plug some of the (many, many) gaps in my reading, hence the desire to cover a mix of modern classics alongside contemporary novels. If you’d like to try Wharton, Cathy (at 746 Books) and I are planning a readalong of The Age of Innocence in February. It does sound like a good starting point for her society novels, so feel free to join us (no pressure, though)! I haven’t read Wharton, as we discussed on Twitter, but I want to, I need to. I don’t think I can call myself an English and American graduate without having read anything by her. So, thank you for your review, for reminding me what an amazing author she is and why I should read her. Thanks, Elena. I loved this one; the psychological dynamics are very interesting, and her prose is wonderful. She’s one of the greats. I love this book, and it’s always lovely to see it being celebrated. I’m tempted to read it again, because it’s been a while …. This is my next Wharton. I love her style. I loved The Custom of the Country and The Age of Innocence. I laughed a bit at her enthusiasm for French culture in French Ways and their Meaning. I’ve seen you haven’t read The Custom of the Country yet: lucky you, you have a great book ahead of you. Undine Spragg is like no other heroin. I loved Mirth and can’t wait to see what you make of Lily Bart! I hope you enjoy this one too. Isn’t it interesting how the classics have the enduring power to speak to us today? The part which struck me so forcefully was about perceptions bein more important than truth. I still find this applicable to our 21st century, and I suspect it will always be true. Even The Little Prince lamented that no one saw with his heart any more. It is, Bellezza. In fact, Emma (at Book Around the Corner) has just reviewed Steinbeck’s The Grapes of Wrath, a novel that sadly remains relevant to the US of today. I suspect you’re right when you say perceptions will always be more important than the truth. I’m sure we’ve all experienced situations in which misunderstandings or others’ perceptions have affected us in some way. Actually, I’m very interested in the relationship between perceptions and reality as my work involves customer research, and it can be fascinating to try and understand how individuals form certain beliefs about a topic. This is the next Wharton on my list, I wanted to read Ethan Frome and Summer before getting into her society novels. And I plan to visit her summer residence one day, not far from where I live. She was an interesting character herself, with her alleged matchmaking ways, connecting wealthy young American heiresses with impoverished British landowners – very Downton Abbey :) I think she is similar to Irene Nemirovsky only the cultural landscape is very different. Nemirovsky’s Fire in the Blood is an excellent companion to Ethan Frome and a wonderful contrast in terms of character response. I definitely want to read more Wharton and The Age of Innocence will be my next (although I’m very tempted to reread Ethan Frome this winter). I hope you enjoy Mirth and Lily Bart’s company as much as I did. Oh yes, you must visit Wharton’s summer retreat if you live nearby. The Mount, her Massachusetts residence, looks quite something from the pictures on the net. That’s an interesting comparison with Irene Nemirovsky, and I’m struggling to comment on it as I’ve only read Suite Francaise. In fact, my memory of Suite is quite fuzzy now which is one of the reasons I’ve started blogging. If nothing else, it’ll provide a means for capturing my thoughts on books! I’ll take a look at Fire in the Blood, I’m sure you’ve blogged it. Yes, if I remember correctly I think I review them one after the other. Fire in the Blood is quite a short easy read, as is Ethan Frome, novellas really. Suite Francaise was also before I began blogging and I definitely recall more of the books I’ve written about! It does sound fabulous. I’ll repeat the Age of Innocence recommendation which I was (pre-blog sadly) blown away by, though it’s so famous it hardly needs a recommendation. The only other I’ve read so far is Ethan Frome (which is on the blog, not a cheery read I’d say). I’ll probably make this my next and then save back Custom, which I suspect might be my favourite once I get to it. And I own a copy already it turns out, hurrah! Lily Bart is fascinating, and I think you’ll find much to enjoy in the way the society set operate (and I need hardly say that Wharton’s prose is marvellous). I hope you’ll review Mirth when you read it as there’s so much depth and nuance in this novel, plenty to work with. Have you read Cassandra at the Wedding by Dorothy Baker? If not, it might be of interest to you (I reviewed it a month or so ago). The period is much later as it’s set in the early sixties, but Cassandra is another complex character, a bit of of a mess really and full of contradictions. It’s an absolutely brilliant book, another of my favourites this year, and I think you’d enjoy it very much. Oddly enough I have your Cassandra review open in another window, I’ve not had a chance to read the review yet, let alone the book which without you I doubt I’d have heard of. I’ll definitely review Mirth when I get to it, hopefully before year’s end. Oh, cool. How spooky! Would love to hear what you think at some stage. nice review, Jacqui :) I think I’ve missed this one. I like the way you described Lily as a character. But then I wonder, is luxury really important at that period of time? Or is it just her desire for glamorous life, prompted by her surrounding society? My fellow Indonesian blogger ever read one of Wharton’s books (I can’t remember which one) & from what she said in her review I gathered that Wharton is really a great author. Thanks, Ratih. I think it’s Lily’s desire for a glamorous life, to keep up with the social set to which she aspires…it’s all rather tragic. Wharton’s a truly wonderful writer, an acute observer of social situations and dynamics. She’s one of the greats. I hope to read The Age of Innocence in the next month or two.